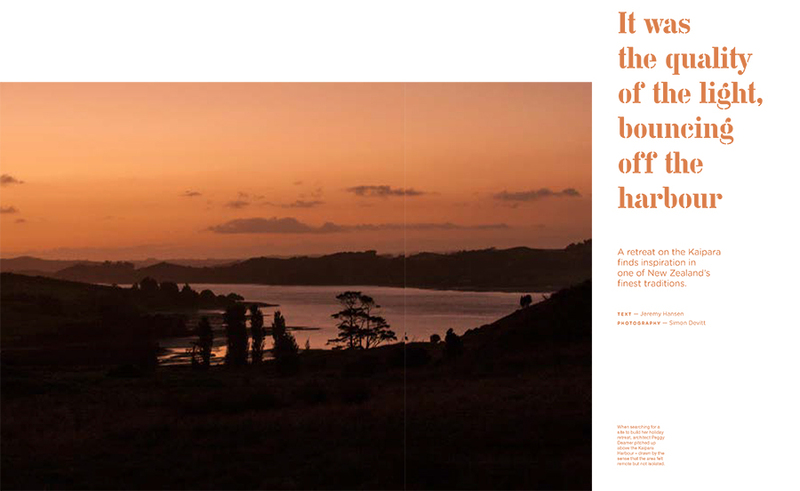 It was the quality of the light, bouncing off the harbour – A retreat on the Kaipara finds inspiration in one of New Zealand’s finest traditions. This sense of easy-going practicality stayed with her when, in 2014, she purchased a small piece of land on an inlet on the Kaipara Harbour and decided to design a summer place for herself there. She quickly realised her limited budget would never allow her to build a house big enough to provide bedrooms for everyone if her family came to visit. (Deamer’s daughter, Frances, lives in Auckland, while her son, Cam, visits regularly from the US). Tents were an obvious way of providing extra summer bedrooms, but her property didn’t offer a flat space to pitch them. So she began contemplating a platform on which they could be erected: a covered, elevated campsite from which to enjoy the view. Deamer was perfectly comfortable with the idea of inhabiting the tents herself, so much so that she initially thought she might live in one on the platform and later add a small dwelling to the site. However, she soon learned that it was more cost-effective to build everything at once. 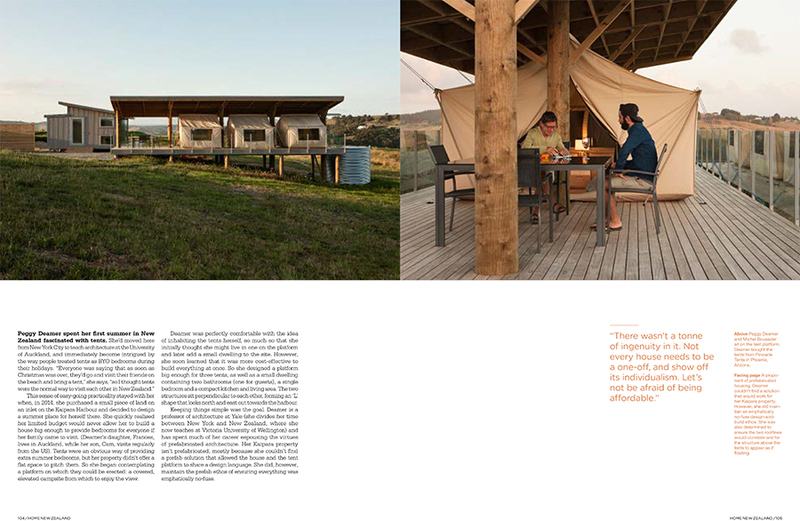 So she designed a platform big enough for three tents, as well as a small dwelling containing two bathrooms (one for guests), a single bedroom and a compact kitchen and living area. The two structures sit perpendicular to each other, forming an ‘L’ shape that looks north and east out towards the harbour. Keeping things simple was the goal. Deamer is a professor of architecture at Yale (she divides her time between New York and New Zealand, where she now teaches at Victoria University of Wellington) and has spent much of her career espousing the virtues of prefabricated architecture. 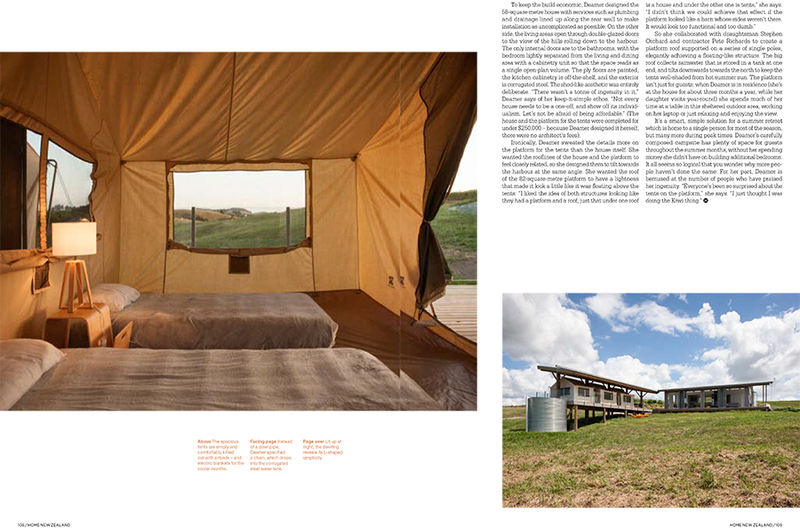 Her Kaipara property isn’t prefabricated, mostly because she couldn’t find a prefab solution that allowed the house and the tent platform to share a design language. She did, however, maintain the prefab ethos of ensuring everything was emphatically no-fuss. To keep the build economic, Deamer designed the 58-square-metre house with services such as plumbing and drainage lined up along the rear wall to make installation as uncomplicated as possible. On the other side, the living areas open through double-glazed doors to the view of the hills rolling down to the harbour. 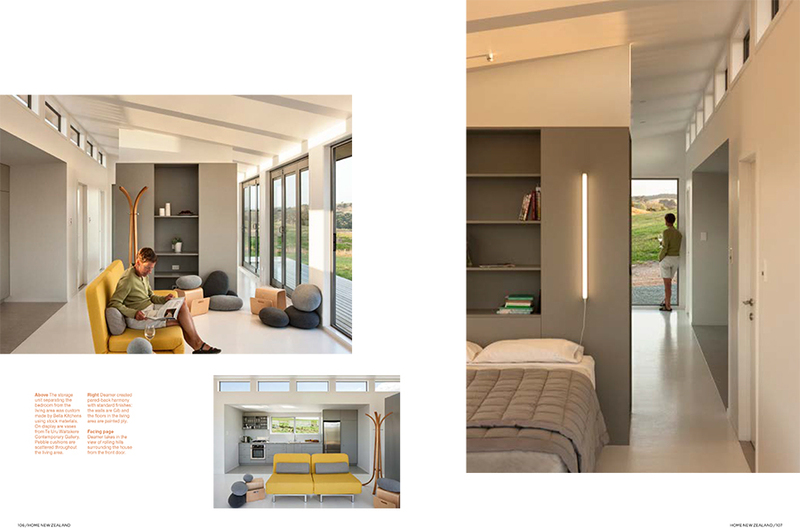 The only internal doors are to the bathrooms, with the bedroom lightly separated from the living and dining area with a cabinetry unit so that the space reads as a single open-plan volume. The ply floors are painted, the kitchen cabinetry is off-the-shelf, and the exterior is corrugated steel. The shed-like aesthetic was entirely deliberate. “There wasn’t a tonne of ingenuity in it,” Deamer says of her keep-it-simple ethos. “Not every house needs to be a one-off, and show off its individ-ualism. Let’s not be afraid of being affordable.” (The house and the platform for the tents were completed for under $250,000 – because Deamer designed it herself, there were no architect’s fees). So she collaborated with draughtsman Stephen Orchard and contractor Pete Richards to create a platform roof supported on a series of single poles, elegantly achieving a floating-like structure. The big roof collects rainwater that is stored in a tank at one end, and tilts downwards towards the north to keep the tents well-shaded from hot summer sun. The platform isn’t just for guests: when Deamer is in residence (she’s at the house for about three months a year, while her daughter visits year-round) she spends much of her time at a table in this sheltered outdoor area, working on her laptop or just relaxing and enjoying the view.